Wow, check out this original 1936 Olympic stadium souvenir building replica. 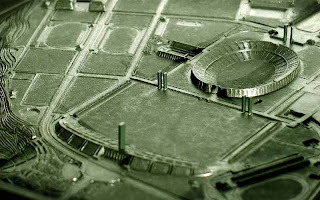 The dark, green bakelite model includes the Olympic Stadium and the surrounding complex. Architect Werner March designed the complex. This commemorative souvenir was recently auctioned on eBay from Belgium and sold for $676. It included the original cardboard box with hinged lid and clasp. 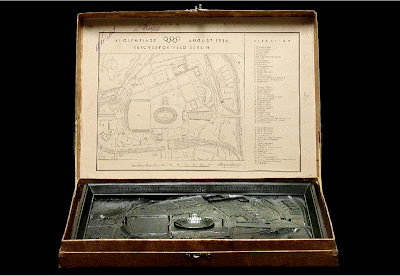 Inside the lid, a diagram and map with information about the complex survived. The XI Olympiad Reichssportfeld souvenir measured 1 inch high and almost 12 inches wide. I wonder how many of these have survived. The real Reichssportfeld (sport field of the Reich) was built when the Nazis came to power in Germany (1933). They wanted to use the Olympic Games for propaganda purposes. Construction took place from 1934 to 1936 on the site of another stadium. When the Reichssportfeld was finished, it was 1.32 square kilometres (326 acres). It consisted of (east to west): the Olympiastadion, the Maifeld and the Waldbühne amphitheater in addition to various places, buildings and facilities for different sports in the northern section. One of the most memorable events of the 1936 Olympics was the performance of the African-American track and field athlete Jesse Owens, representing the United. Owens was awarded the gold medal in 4 categories. During World War II, the area suffered little damage.After the war, the United Kingdom military occupation used the northern part of the Reichssportfeld as its headquarters until 1994.The stadium was renovated in 2004 including the addition of a roof. I have one of these, amazing detail, great post!